More than 50,000 customers and 20 million daily users in more than 140 countries take advantage of our unique technology breakthroughs and virtual computing solutions. Our new N-series Thin Clients for Citrix HDX deliver 100% of the amazingly rich HDX experience at approximately 1/3 the cost of typical HDX-capable PCs and traditional thin client devices. Powered by our third-generation Numo™ 3 System-on-Chip (SoC), N-series devices support and simplify XenDesktop, XenApp, and VDI-in-a-Box desktop and application virtualization deployments with full HD video while using less than 5 watts of power. 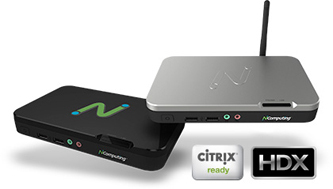 With centralized device management and mission-critical premium support, N-series devices from NComputing dramatically lower both price and complexity compared to alternative endpoints and transform the economics of enterprise desktop virtualization by enabling organizations to more fully extend their Citrix and HDX deployments. Next generation Numo 3 System-on-Chip (SoC) dramatically simplifies the overall design, increases efficiencies and reliability, and is the enabler for features and performance intended to best that of a PC or other HDX-capable thin clients. Provides a rich, uncompromising multimedia experience for knowledge workers and other enterprise desktop virtualization users with demanding application environments. Accelerates mainstream desktop virtualization adoption by dramatically disrupting existing economics as the new price/performance standard for HDX-capable thin client devices. Options for dual monitor and wireless connectivity – available for N500. vSpace Management Center software and Premium Support combine to provide maximum ROI allowing organizations to configure and manage thousands of devices from a single console and take advantage of ongoing N-series advancements and enhancements.